In the minutes before the funeral of Cardinal William H. Keeler, several people used the same two words to describe the atmosphere inside the Cathedral of Mary Our Queen in Homeland: family reunion. Men, women and a few children came to mourn the 14th archbishop of Baltimore March 28, when the celebration of his life served as an opportunity for old friends and former colleagues to embrace, reminisce about the cardinal and catch up on their own lives. Nowhere was that camaraderie more evident than among the priests of the Archdiocese of Baltimore, from the 58 who were ordained by Cardinal Keeler from 1989 to 2007, to the eight mostly more seasoned men who served as his pallbearers. 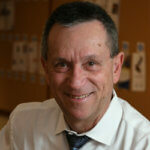 Monsignor Robert Jaskot, ordained in 1989, was the only priest who fell into both categories. Like his fellow pallbearers, the pastor of three parishes in Frederick County served Cardinal Keeler in the chancery, as his priest secretary. 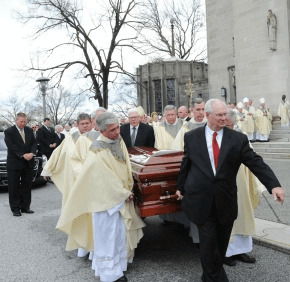 Several pallbearers talked about the genuine care and concern Cardinal Keeler showed for the priests of the archdiocese. Monsignor Jay O’Connor, pastor of Our Lady of the Fields in Millersville, was Cardinal Keeler’s first vocations director in the Baltimore Archdiocese. Monsignor J. Bruce Jarboe, pastor of St. Ann in Hagerstown, served in the Office of Clergy Personnel under Cardinal Keeler. Father Gerard Francik, pastor of St. Mark in Fallston and another former vocations director, saw that same interest. That extended to the start of a man’s ministry, as, at Cardinal Keeler’s urging, seminarians wrote to him at Christmas and Easter, providing updates on their families and studies. Father Patrick Carrion, pastor of the Catholic Community of South Baltimore, appreciated Cardinal Keeler’s openness to suggestions when he served in clergy personnel. Father Carrion was among those who enjoyed last-minute invitations to dinner at the archbishop’s residence. Even if the fare was a microwaved meal, it usually included a glass of wine and conversation about a shared passion – travel. The other pallbearers were Father William P. Foley, coordinator of pastoral care for retired priests; Father John “Jack” Ward, pastor of Prince of Peace in Edgewood and St. Francis de Sales in Abingdon; and Father Michael J. White, pastor of Church of the Nativity in Timonium. Both Father Ward and Father White served Cardinal Keeler as his priest-secretary. Part of his motivation in caring for priests was so that they would be better able to care for their people.